I watch an hour of television a week. Each fall, my family decides on what show I'll watch with them. This season it's The Blacklist. But for one month of the year, starting tonight, I turn into a TV junkie. I'm addicted to Christmas movies. Him during a commercial: "I know why you love these movies so much." Him: "They're like the books you write." The narration could be the back cover blurb for a sweet romance! This holiday movie and so many others that I love to watch over and over again are like the sweet romances on my keeper shelf, in my TBR pile and downloaded to my Kindle, ones like the Sweet Romance Reads authors here at this blog write. Heartwarming, emotional stories full of community, family, home and, of course, love. Stories that allow us to escape for a couple hours and make our hearts sigh when we reach the happy ending. If you're like me and can't wait to see the new movies out each holiday season, try a sweet romance or two if you haven't already. Trust me, it's a good way to tie yourself over from January until the day after Thanksgiving when the Christmas movie watching binge begins! (At least mine.) Why do you think I save up some of the Christmas romance novels in my TRB stack and don't read them until after New Year's? Do you have a favorite Christmas movie you love to watch? Melissa McClone has written over twenty-five novels for Harlequin Books and Tule Publishing Group. She's also been nominated for Romance Writers of America's RITA award. Melissa lives in the Pacific Northwest with her husband, three school-aged children, two spoiled Norwegian Elkhounds and cats who think they rule the house. You can learn more about Melissa at her website. 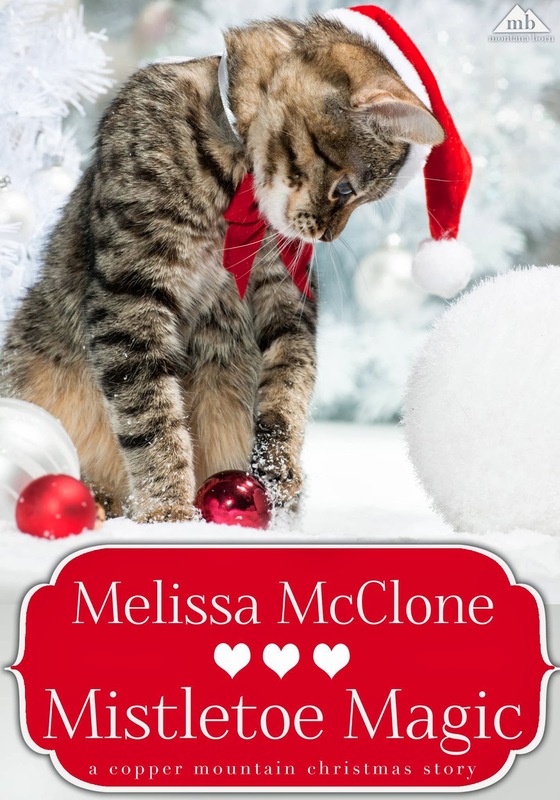 Melissa has three new Christmas stories out right now, ones she hopes readers might consider Hallmark Channel worthy. A Little Bit of Holiday Magic from Harlequin Romance is available at most digital retailers, including Amazon, iBooks and B&N. Home For Christmas is part of Montana Born Books' A Copper Mountain Christmas novellas and available at Amazon. Mistletoe Magic, a short story companion to A Copper Mountain Christmas series, is available at Amazon, bn.com and for free at Smashwords. I tend to go for the older Christmas movies like White Christmas as they seem to be more romantic. I'm not such a fan of the modern silly comedy Christmas movies. But I haven't seen the Hallmark channel or any modern Christmas movies like The Christmas Card. I would love movies like that! I'll have to check if we have the Hallmark channel in the UK. Hallmark Channel releases some of theirs on DVD. You might be able to find them on streaming. I'm not sure if Lifetime does, but our cable company puts many OnDemand so you can watch when you want. Not sure if they do that in the UK. I like the more modern Christmas movies. I like your choice of a favorite. I saw that one, Shari! I've had to pull over on the side of the road due to crying so hard when the song played on the radio. Now I change radio stations. I love Christmas movies and books too! I have seen the Christmas Card a couple of times. I really enjoyed it. My mom and my stepdad have been married for 22 years now, and they met because we send Valentine's Day cards to any service person during Desert Storm and my step dad picked my moms card out of a barrel of thousands and that began their courtship and love affair. Your post gave me chills, Kimberly. That is so cool! And very romantic! Thanks for sharing that! It really was fun to watch them get to know each other. He was on a ship (He was a Marine) and this was preinternet days so they wrote each other daily and my mom put them all in a book to keep. I wish we had a hallmark-type channel here in NZ! Christmas movies - definitely The Santa clause - Tim Allen - and the 1960/70 movie of The Railway Children - love them both! I enjoyed the Santa Clause, Joanne, but The Railway Children is new to me. I'll have to look it up! I have been DVR all the new Christmas movies on Hallmark. The older one's I have seen several times.On of my favorite movies is The Holiday, will have to catch it some time. I have been so busy I haven't looked at what's coming, Quilt lady. I've just turned on the TV and watched what's there! Smart to DVR them. We don't have one of those. Might have to add that to the Christmas list. We always watch several versions of "A Christmas Carol" -- so many interpretations to choose from, and so uplifting! I also love "The Homecoming," "Christmas in Connecticut," "Elf," "The Polar Express" ... the list goes on and on. Christmas really does warm the heart! I used A Christmas Carol in my novella Home For Christmas. It just fit! We always get a kick out of Elf and Christmas in Connecticut is such a great one, too! My kids love Polar Express. Is The Homecoming the Walton's one? Those are so wonderful! I really enjoy Holiday Inn with Bing Crosby and Fred Astaire!